Really like these guys. Looks like they would be a really competitive unit. Looking forward to playing them these guys online one day(Hopefully). Nice work Beta + Crew. Well when they're not engaged none of their power can be used so I guess they have pretty hard time against range. Maybe their very cheap price and their big move can overcome this problem. 5x Ants + Q9 + Keamon/Nakitas would be a good army to try. I don't think Marcus is worth it because only the move bonus is usefull. This !move bonus really helps against range tho. Last edited by Foudzing; March 6th, 2014 at 06:41 PM. Balance- In many matchups, Grommel brings relatively little to the table for his pricetag. Foe Hammer is an unreliable power, since it requires first: enemy figures in the right place, second: a wound inflicted, and third: a roll of 14 or higher. Meanwhile, Tactical Repositioning is only useful when there are heroes around that at least occasionally get an OM. His stats look good at first, but 3 defense is on the low end for melee figures without defensive powers. Foe Hammer also makes things hard for him, since it makes him a target and encourages him to engage with multiple opponents. His 7 life is a nice cushion and helps him stay in the fight a little longer, but is not too hard to burn through with focused attention. Grommel is (appropriately), priced for his best scenario: facing an army where heroes will be getting OMs at least once a round and the figures are encouraged not to spread out. However, that makes him a little bit of a niche figure and probably not someone that most players would bring to a double-blind tournament. Playability- I enjoyed trying Grommel in heroes-only and dungeon-crawl scenarios with all-Dwarf heroes. He was very, very good at repositioning my other Dwarves and using them to tie down any enemies that tried to flee or gain high ground. In more traditional matches, Tactical Repositioning came up less often and was less effective, relatively speaking, but still occasionally useful. For being the most expensive Dwarf hero, he also felt a little softer than Migol and Ulfrid. Powers: As written, Foe Hammer is a mandatory power, that randomly triggers. I don't see how that fits Grommel's strategic persona. There are some thematic defenses that could be made for it--maybe the Hammer itself inflicts the extra wounds, or maybe he sometimes gets enraged in battle (which still doesn't really fit his persona). Overall the power is not a deal-breaker, but it feels off. Tactical Repositioning, as a turn interruption power, really gets into tricky territory. It doesn't break the game in any situations that I'm aware of, nor is it "broken" in the competitive sense as far as I could tell. However, it interrupts the flow of the game for a relatively non-brief action. 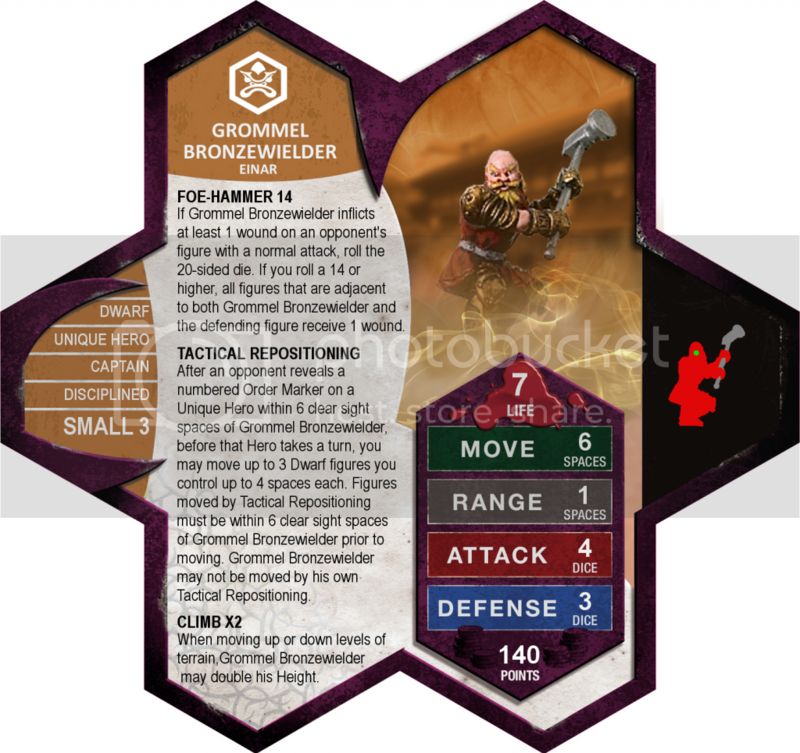 Appropriate Stats: Grommel's life is a bit high for a Dwarf, but it's believable and a semi-acceptable way to give him the expected Dwarven toughness without a defensive special power. I'm not sure why he has 6 move. None of the other Dwarves have 6 move, and I don't see any persuasive reason for Grommel to be different. Visual Distinctness: The sculpt is a little small, but stands out fine and looks pretty great alongside the other Dwarves. Creativity- Foe-Hammer is a new power, reminiscent (but inferior to) Tandros Kreel's Cleave. Tactical Repositioning is the card's most original offering. Theme- As a warlike strategist, Grommel fits in just fine among Einar's hordes. He doesn't really feel like a Dwarf to me, but he doesn't necessarily feel un-dwarfish. Tactical Repositioning takes turn interruption just a little too far in my book. Other turn-interruption powers in Heroscape tend to be triggered by actions the other player can usually choose not to take; a player can choose not to attack a Deathreaver, or a Ninja, or not to move next to Elaria the Pale, etc. Tactical Repositioning, on the other hand, doesn't allow the other player any real choice in whether or not it is triggered. I'm sure there are circles of Heroscape players that would appreciate what Tactical Repositioning brings to the table, and I encourage any who feel that way to print his card and try him out. At the same time, it's not a power that should be in the VC extension of the canon. I had other concerns about the unit as well, but each of those probably could have slid by. I vote Nay to induct Grommel Bronzewielder into the Soldiers of Valhalla. Grommel Bronzewielder has received two Nay votes to induct (vegietarian18 and capsocrates) and is removed from the process. He drips with theme. Rejected by death, although it comes from a very different thematic place than the version on Thanos’ card, absolutely fits the figure. In this case, and combined with Undead March, it gives him a fun Army of Darkness feel, which fits his skeleton-y look (and kind of makes me wish he were better suited for use with the Tomb Skeletons). Being a relentless leader also goes hand-in-hand with that idea. The card has only one new power, and in theory it seems like a clever way to “fix” the Death Knights. (Whether they need it or if this is the way to do it I’ll cover later.) Soul Weapon is a natural choice and upping his attack by one is a simple way to make him more powerful as a leader ought to be. Also, bringing Rejected by Death into classic scape deserves creativity points on its own. On the other hand, some aspects of Shaitahn’s gameplay just don’t feel right. Giving the Death Knights a move of 9 plus slow roll backup doesn’t really fit their theme to me. Maybe if the figures moved by it couldn’t be activated on their turn, it would feel more like an inexorable march and be closer to what I would expect from a power called Undead March. Secondly, is that in my testing Shaitahn was an annoying figure. When I test on my own, I can get clinical about the results, so I make it a point to test with actual opponents as well. I had been finding that he was not winning too many of his games, that Rejected by Death on a bonding figure was not as over-powered as it had seemed in Theoryscaping. However, when it came time to play him against live opponents, they all found him annoying. They couldn’t get the drop on his death knights, they would roll their eyes when I would roll the dice before each of my two bonding-induced turns and they would sigh when he would come back. Looking back, Shaitah’s armies lost more games than they won against live opponents but even when the opponent beat his armies they would request to play against someone else the next time because they didn’t enjoy playing against him. I really wanted to like Shaitahn. He had so much going for him thematically, and I have always loved the Rejected by Death power. However, in the gameplay he fell a bit short of his theme, and as the biggest nail in his coffin, he was annoying to play against. Sorry Shaitahn. You’ve been rejected by death and rejected by hivelord. I vote NO to induct Shaitahn into the SoV. Shaitahn has received two Nay votes to induct (vegietarian18 and hivelord) and is removed from the process. Balance- Thoresby Woodsmen have several attributes that make them difficult to balance. Evergreen Camouflage, and to a lesser extent Precise Shot, are both map dependent and match up dependent. This can lead to a wide variety of performances. If your opponent can’t reach The Woodsmen, they can kill their points worth and well beyond. But in some match ups they will do little more than serve as target dummies for your opponents. The designer does a good job taking into account both extremes when pricing the Woodsmen. Even at their best, there are still strategies and units that counter them, so they don’t feel broken or unbeatable. Creativity- The Thoresby Woodsmen have a nice combination of a reused power in tracking, an upgrade of an old power in precise shot and a twist on an old power in Evergreen Camouflage. All this combined makes for a unit that’s original and creative. Theme- Overall the Thoresby Woosmen are solid thematically. The Woodsmen personality, class, attack, move, defense etc., all fit fine. Their range is a little high compared to other common human squads with bows, but 7 range is not unprecedented in bow squads. The fact their a 2 man squad is enough to justify their range from a game play perspective. The one semi major thematic concern I have is jungle not working for evergreen camouflage. Of the few figures that have powers that incorporate trees, none make a distinction between the two types of trees. I don’t see a thematic reason to break this precedent. This is far from a deal breaker, and requiring powers to include both types of trees isn't an unbreakable precedent, but it still seems odd. Playability-There are some intricacies to their design that I enjoyed. The Thoresby Woodsmen don’t always want a large amount of trees on a map. All other figures with a terrain dependent power want as much of the terrain or tile that benefits them as possible. In some match ups multi RttFF maps like Highways and Dieways, Blackroot, and Flash Fire will not be as beneficial as the likes of Marr Highway and Ruins of Pine Tree Marsh. Another thing I noticed was without evergreen trees they are weak versus range and stronger versus melee, but on maps with trees, they become stronger versus range and weaker versus melee. This is an interesting dynamic not seen in other units. A large driving force for the Thoresby Woodsmen play style is the fact that they are a 2 man squad. This sets them apart from other squads that on the surface may seem similar. Their low base attack and lack of attacks per OM leads to Precise Shot being their most important power. Usually it’s advantageous to forgo the opening attacks so you can track to height. Once on height you’ll find that if opponents are in range there is little incentive to continue reinforcing your position by moving up more Woodsmen. If opponents aren't in range of your forward Woodsmen, you’re usually better off activating other units in your army than chasing the battle with your Woodsmen. If you continue moving up more Woodsmen behind your screen, statistically you won’t be putting many wounds on your opponent. During this time your opponent will have virtually free rein to attack your screen and move about the board with relative impunity. Once your opponent gets through your screen and starts attacking the Woodsmen they aren’t going to last very long, so why invest OMs moving a large force up, when a couple squads suffices. This ratio between the two different tactical decisions of attacking or moving up is unbalanced. It leans too heavily towards the attack portion. This is one of the main problems with the Woodsmen; it leads to the majority of your squads left sitting in your starting zone. Because of this the Woodsmen are one of the few ranged squads that aren’t at their best as bread and butter units. This conservative play style partnered with their almost complete inability to play aggressively means the Woodsmen will need a screen of some sort to be successful. More so then arguable all other ranged common squads. Without it the Woodsmen will have a lot of trouble getting enough Precise Shots to get their points back. These aspects of their play style on their own aren't wholly negative, but together they pose some serious problems. Their reliance on screens, play style that encourages turtling and their discouragement of activating a large amount of Woodsmen makes for a unit that lends itself to long games with few strategic decisions to be made. The all or nothing aspect of both Precise Shot and Tracking makes for few tactical decisions relative to other ranged common squads. All this to go along with the imbalance between the decision to move or attack, which is in my opinion their most serious flaw. I liked many aspects of the Thoresby Woodsmen, but there are simply too many flaws from a game play perspective. I vote to induct the Thoresby Woodsmen. I can see that from a gameplay perspective, these guys aren't the best, but I loved reading your review! I think the "problems" they have are extremely flavorful! Things like: move or attack, but in most cases don't do both; Shooting with just a couple guys when the enemy moves in range rather than moving an entire company up; getting mowed down when overrun. I love it! Not necessarily a 1:1 comparison, but I figured that guys who grew up in the forests of England wouldn't necessarily be the best camouflage masters in the Jungles of Valhalla. And the ability is about being completely unseen and not being targetable for normal attacks - not just mostly unseen and getting extra defense like what the Jungle Trees already do. Balance- Here lies my biggest concern with Pygar Fasir. His point value is one normally reserved for end-game units: fillers and cleanup heroes like Guilty McCreech, Siiv, or Isamu. Those figures often pack a potent punch balanced with a frail frame and low consistency. Pygar one-ups them in every category. 3 defense on 3 life may not seem like much, but his consistency paired with high-ground and the ability to re-roll failed dice makes him very tough for his point value. Ranged figures like the 10th Foot can force him to come to them while maneuvering themselves into advantageous positions. But melee armies facing him in the endgame really struggle. 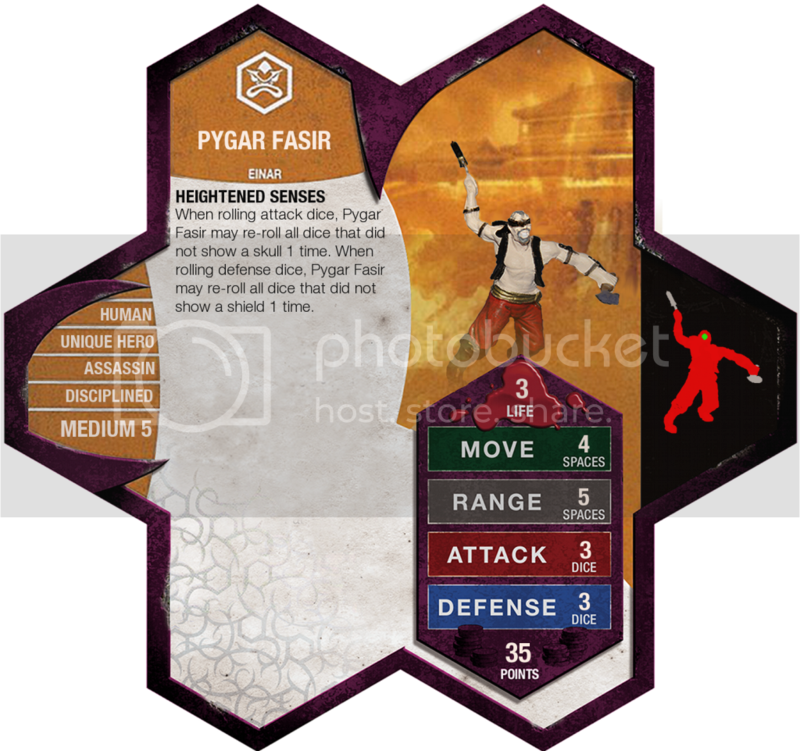 Playability- At his low point-value, Pygar usually occupies a filler role. In that role he does admirably, usually able to kill whatever's left of the enemy army as long as it can't roll too many attack dice or outrange him. He also performs surprisingly well in a firepower role; in one game I tested him with Raelin and Taelord against Tornak and an army of Blade Gruts. He managed to kill Tornak and 11 of the Gruts before they eventually took Raelin down and eventually killed him on a few whiffs. Overall I found him fun and surprisingly potent. Powers: Heightened Senses is super-easy to use. Appropriate Stats: Thematically, 3 defense seems a little high for a completely armorless dude. Otherwise his stats seem appropriate for the figure. As far as his target point value is concerned, his stats would seem much more appropriate with only 2 life and 2 defense--3 life and 3 defense make him very consistent for a 35 point figure. Or perhaps if his point value were closer to 75 his stats might seem more appropriate. Visual Distinctness: There aren't any other blind, shirtless dudes in the game yet. Creativity- Pygar does enough, creatively--his power touches ground that few previous powers have touched and he plays on a trope (the blind person with superhuman senses) that Heroscape hasn't played on yet. Theme- Rerolling dice is far from the only way to represent superhuman senses, but it works well enough thematically. The idea of Pygar is neat, and it would be nice to see some more variety in the filler category. However, I'm concerned that there are too many endgame matchups where he offers the opponent a disproportionately small chance of success for his point value. If your opponent reaches the endgame and has to face down a 35-point hero, they shouldn't feel certain defeat looming over them unless their army has diminished to a smaller point value. Although there are some scenarios where he's arguably priced correctly, those scenarios are largely outweighed by the scenarios where he is not. I vote Nay to induct Pygar Fasir into the Soldiers of Valhalla.